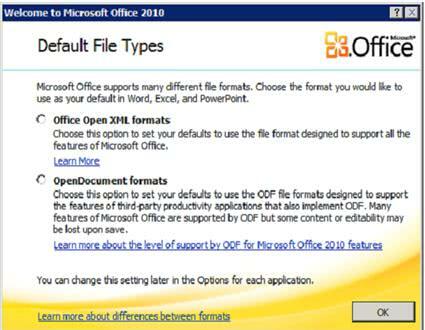 Microsoft has added support for ODF 1.1 in Microsoft Excel 2010, Microsoft Word 2010 and Microsoft PowerPoint 2010. The Open Documents Format is available as an alternative file format in Microsoft Office 2010. Office 2010 displays a "Welcome to Microsoft Office 2010 screen" on the first start of PowerPoint, Excel or Word in which the user is aksed to select a default file type. Available for selection are Office Open XML formats, the standard Microsoft Office formats, or OpenDocument formats. Selecting Microsoft's own format ensures full compatibility with all Office 2010 features while some contents or editability may be lost if the ODF format is selected instead. Selecting a default file type simply means that Microsoft will save the documents in that format. It is still possible to select a different format in the Save As dialog whenever it is needed. Microsoft has created a table for Excel, Word and PowerPoint that outlines the level of support for the ODF format. Available support levels are supported, meaning that the ODF format supports the feature, partially supported, meaning that formatting or usability might be affected but text or data is not lost, and not supported meaning that saving the document in the ODF format could lead to losing content, formattting and usability. OpenXML was originally developed to reflect the features and behavior of Microsoft Office. Microsoft Office now provides support for ODF and gives Microsoft Office users the opportunity to save their documents in ODF. However, because Microsoft Office and OpenOffice features are not exactly the same or are not implemented the same way, Microsoft Office users who use the features that are not fully Supported (see below for a list of links for these features) in ODF may experience changes in the editability of the document and sometimes see a loss of content when saving their document in ODF. Here are the steps for Excel 2010. Click Save, and then under Save workbooks, in the Save files in this format list, click the file format that you want to use by default. Here are the steps for PowerPoint 2010. Click Save, and then under Save presentations, in the Save files in this format list, click the file format that you want to use by default. Here are the steps for Word 2010. Click Save, and then under Save documents, in the Save files in this format list, click the file format that you want to use by default.